Who can a Debt Collector Call? - Florin Legal, P.A. 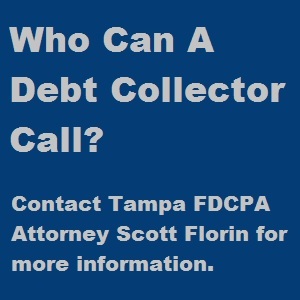 Who can a debt collector call while trying to collect a consumer debt? As a general rule, the Fair Debt Collection Practices Act (FDCPA) prevents a debt collector from communication with third parties. 15 U.S.C. § 1692c(b). Identify himself and state he is confirming or correcting location information. Only if requested by the person can he identify his employer. Communicate with anyone other than the consumer’s attorney (if represented), unless the attorney fails to respond. Communicate with a represented consumer (unless attorney fails to respond or debtor initiates the communication). FCCPA (debt collectors and original creditors) up to $1,000.00 and actual damages embarrassment, humiliation, stress, etc.). Both statutes shift the responsibility for attorney fees to the opposing side which allows Florin Legal, P.A. to accept cases without any upfront costs or expenses. Please contact Florida FDCPA Attorney Scott Florin for a free case evaluation or additional questions about unlawful third party contacts.